Because reservoirs are expected to remain low at certain points of every year (especially this time of year) for the foreseeable future, there are mandatory water restrictions on all Darien property. First Selectman Jayme Stevenson recently described the restrictions and reminded residents that Aquarion Water Co. will be watching for violations more vigilantly especially now, when reservoir levels tend to drop. “At this time of year, we are trending toward the drought triggers, as Aquarion and the state drinking water department have outlined them,” Stevenson said at last Tuesday’s Board of Selectman meeting. Homeowners with odd-numbered addresses “can water on Saturdays and Tuesdays, between those same tie periods. If you have no address number, you can water on Sundays and Wednesdays,” she said. “Aquarion is very flexible with you if you have special circumstances. Contact Aquarion, and you can discuss those. There are certain waivers for the installation of new plants, but I think in July and August they don’t grant those waivers because water is certainly at a premium right now. 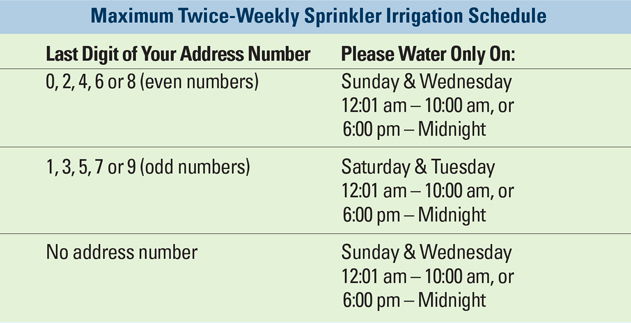 Please limit your in-ground and above-ground sprinkler irrigation to a maximum of twice weekly according to the schedule on the chart below. You may use drip irrigation, soaker hoses and hand-held watering at any time. The New Planting Variance program ended on June 15 and it will reopen on Sept. 1. However, there are no restrictions on drip irrigation, soaker hoses or hand-held watering at this time. Customers with properties two acres or larger and feel they cannot efficiently water the property within the mandatory twice-weekly schedule can apply for this variance. In addition to a required on-site assessment of the irrigation system, the customer must also commit to a 15% water savings when compared to their 2015 usage. Systems must be water efficient and in good working order to be approved for a Large Property Variance. This variance program is available from April 6 to October 31. Customers who have a high-efficiency irrigation system with Environmental Protection Agency (EPA) WaterSense® Weather-Based controller, which runs a schedule based upon site and weather conditions, can apply for this variance. An on-site assessment of the irrigation system is required and the customer must also commit to a 20% water savings when compared to their 2015 usage. With an approved variance, customers can water outside of the mandatory irrigation schedule. This variance program is available from April 6 to October 31. Please check for EPA’s WaterSense® Label to see if you have a weather-based irrigation controller before applying for this variance. In the participating towns, licensed irrigation companies are aware of Aquarion’s Mandatory, Twice-Weekly Irrigation Schedule and Irrigation Variance Programs, and can help you decide which variance would work best for you. Irrigation Evaluation Checklist Form – For use by licensed irrigation contractors when filling out irrigation system information for a variance application. This checklist must be filled out before an appointment with an Aquarion Assessor for an on-site irrigation system assessment. Aquarion Water Company today announced a water main cleaning project in Darien starting Sunday, June 10 and continuing for six weeks between 9 p.m. and 5 a.m. The water main cleaning project is being undertaken to ensure that customers continue to receive the highest quality water. — an announcement from Aquarion The Darien water main cleaning project is estimated to last until Friday, July 20.